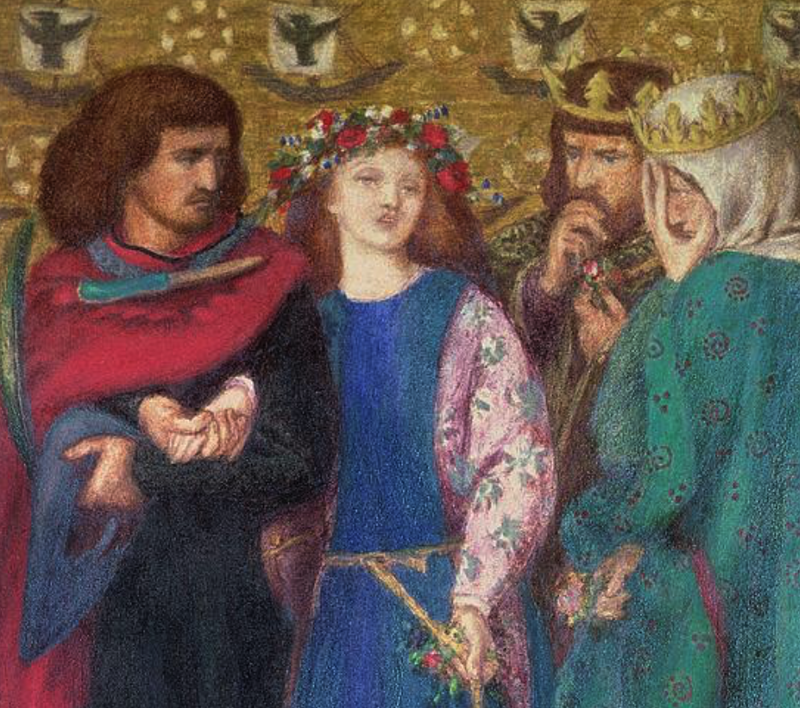 One of the great, new things in Eli Siegel’s critical and dramatic masterpiece, Shakespeare’s Hamlet: Revisited, is his comprehension of the character of Ophelia. It is comprehension magnificent in scholarship, warmth of feeling, and knowledge of the human self. And it’s true to the play, to the lines Shakespeare wrote. As actor, I’m tremendously grateful to have had the honor to present what I learned from Mr. Siegel’s seeing of Ophelia as I performed the role—one of the deepest, most rewarding experiences of my career. Who is Ophelia? What is her character? What can women today learn about ourselves through understanding this young woman of Denmark in Shakespeare’s immortal play? It’s been felt by audiences and also by critics over the years that Ophelia is an innocent, naive girl, who loves Hamlet, and is deeply hurt by his severity with her, sees his distress as madness, and later, grief-stricken, goes mad herself, drowning in a brook. Yet if we study the play carefully, this pathetic and noble picture is not in keeping with the character Shakespeare created. For example, when, in Act I, Scene 3, we first hear Ophelia speak, as her brother Laertes warns her against Hamlet, and she banters lightly with him, she gives no hint of her true feeling. Can we surmise that the demure Danish girl is not just naive, but perhaps crafty? How different this is from the way Shakespeare portrays other young women, say Juliet in Romeo and Juliet, Miranda, in The Tempest, or even Hermia in A Midsummer Night’s Dream—who gracefully and bravely stand up to their fathers in behalf of the men they love. Does a Woman Have Motives? “Ophelia,” Eli Siegel explained, “has been seen too often as one sadly affected by other people’s doings.” But, he continued, “It is hard to be alive and not have motives.” What is Ophelia’s motive as she talks with Hamlet?—while her father has hidden himself to hear them converse? Does she want to show herself sincerely to Hamlet, or fool him by presenting a pretty, winsomely sad arrangement of herself? Is she motivated by love and the desire to know, or something very different? Is she after something narrow, or something wide, generous? For all her demureness, is Ophelia deeply cold? We have Shakespeare showing the person whose own mind will be “overthrown” exclaiming most about the mental peril of another, and the mental misfortune. We find that Ophelia is severer on Hamlet’s state than the King is—the King says: “What he spake, though it lack’d form a little, / Was not like madness.” But Ophelia is a bold judge. She doesn’t have much of an inclination to enter into another’s mind; but if that mind is not in keeping with what she is looking for—there—it is meeting, or it has met, disaster. The ready way Ophelia has of negatively appraising Hamlet is an indication of what is to happen to her. Hamlet is intense, hardly urbane; acrimoniously stylistic; harshly descriptive of feminine possibility—but sense is honored. The sense is what Ophelia doesn’t want to see. Such a lack of mental going forth bodes not well. And, as was said, the way Ophelia sees madness in another—and Shakespeare perhaps meant it—is a prefiguring of insanity for Ophelia later.